Thank you to these small shops for sending these darling pieces in collaboration with my fall post. As always all thoughts and opinions expressed here are 100% my own. 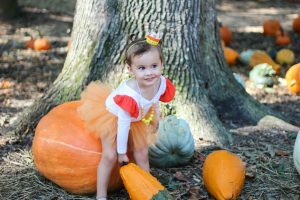 When I was told the baby in my belly I had been growing was a girl I count’t imagine the fun I would have dressing her up. Now that she’s a toddler, she loves clothes and accessories too. 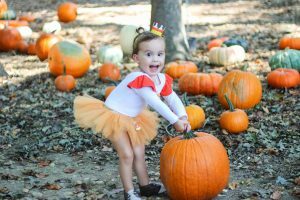 For pumpkin patch fun and perfect fall photos I found a few darling shops that create gorgeous items. 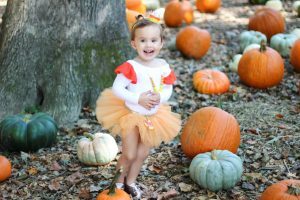 I mean, who doesn’t want a candy corn inspired outfit for the pumpkin patch? The custom leotards are my favorite right now. Stylin Sophie is a darling shop I found on Instagram. They have boutique items and custom tops and leotards. So if you have a birthday coming up or social occasion you should reach out for your little’s leo. Costumes galore at StellaMarisTutus! You have to see for yourself, because you will be shocked by the details that go into each piece she designs and creates. We are getting Izzy’s halloween costume from her shop. Getting Sew Crafty is a shop I’ve been buying from since Izzy was an infant. I use to wear teething necklaces while nursing. Now Izzy wears all the toddler necklaces. They look adorable and are safe for her to put in her mouth when teething. She has designs for boys and girls. 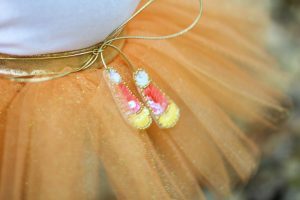 Fairytale Dreams is another shop we have been loving for years. When Izzy was only 6 months In ordered a crown from this shop for her 6 month photo shoot. Ever since then I’ve been hooked. 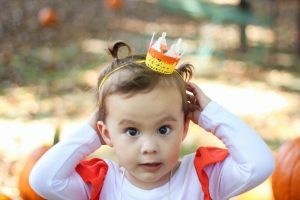 Crowns for bday parties, costumes and more. A little girl can never have too many crowns right? You can order a crown for your little prince too! Happy Fall & Happy Shopping Friends! Absolutely love this theme! The necklace and crow are adorable! Happy Halloween! 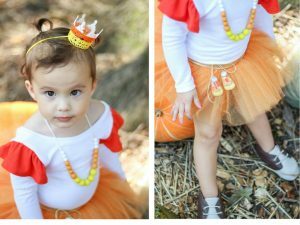 Oh my gosh, how amazing is that little candy corn crown? She looks beautiful, and so festive!